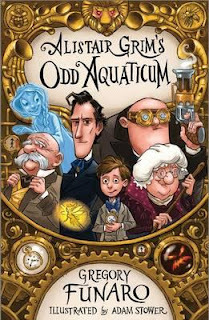 The crew of the Odditorium (a flying, magical house) are in hiding after their stand-off with Prince Nightshade in the prequel (Alistair Grim’s Odditorium) wrongly depicted Alistair Grim as the villain. In this, the sequel, the crew of the Odditorium needs to clear Alistair’s name and, incidentally, save the world, by defeating the real villain (Prince Nightshade). The task isn’t easy – Prince Nightshade’s suit of magical armour cannot be pierced with any old magical item. The mythical sword, Excalibur, is the only blade that will, er, cut it. This adventurous quest leads them on a gripping, underwater adventure to Avalon … complete with a dangerous banshee, hostile witch and a good dose of sea monsters. This amusing story is set in Victorian England and narrated in first-person perspective by 12-year-old Grubb, who likes to directly address the reader. He’s quite a likeable character – still the quiet, unassuming, kind-hearted chimney sweep from the beginning of the series. The first novel revealed that the talented sorcerer, Alistair Grim, was his father. This second book in the series reveals the true identity of Prince Nightshade, and adds some more clues about Grubb’s mother. For readers new to the series, the first chapter includes a brief recap of the events from the prequel. It also provides details of the Odditorium, its crew and its sources of magical energy. (In Grubb’s voice: ‘… I best back up to the beginning. Otherwise you might get confused and abandon this adventure altogether.’) As per the first book, there are lots of characters, and lots of magical items (Odditoria) to keep track of. Therefore, the book includes a helpful glossary of both. The chapter openings feature black-and-white illustrations by the award-winning Adam Stower. The whimsical caricatures complement the text perfectly, without interrupting the story. The book will appeal to fans of magical fantasy, aged 8–12 years, who will no doubt be thrilled to learn that Gregory Funaro is busy working away on the next book in the Odditorium series!